My pictures are semi-terrible, the security was intense, but it was a great day with my 2 best friends Melanie and Kelley and that alone was well worth 2 hours of long lines and hot sun. 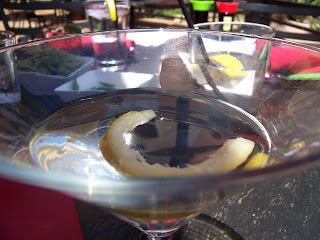 We took the afternoon off work, ate sushi and drank martinis, then proceeded to the event. I love you girls - what would I do without you??!!?? For the record, Giada is BEAUTIFUL, her head is normal size, her oft-mentioned chest is 100% authentic and 100% really nice. She is charming, sweet and friendly. We all wish we could hang with her on a regular basis. 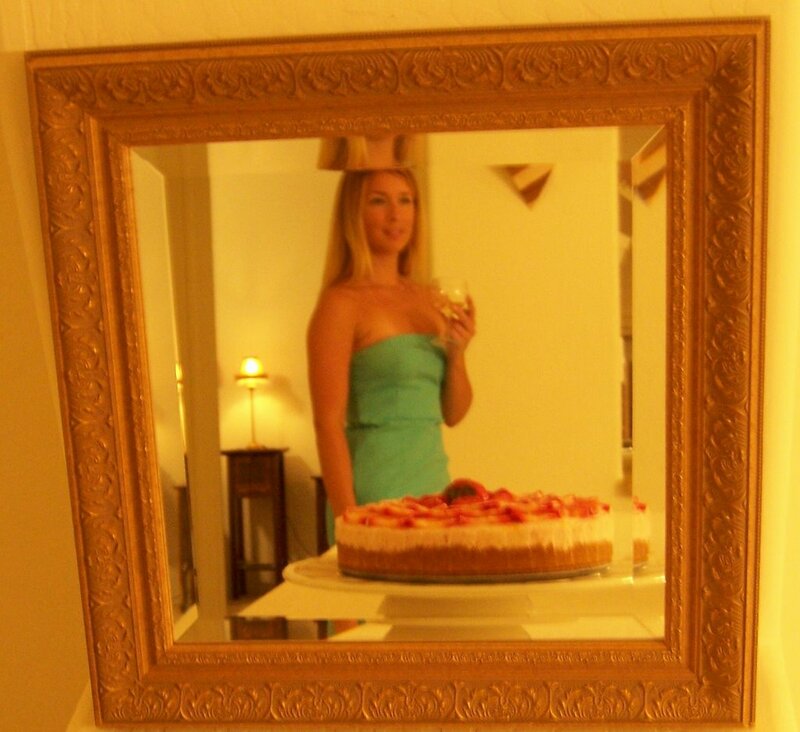 Todd, her husband, is a lucky guy...and anyone lucky enough to eat her food is blessed. 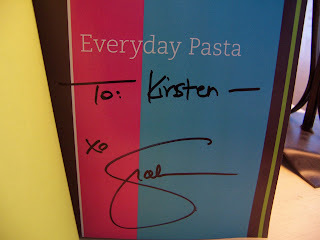 She signed my new cookbook, Everyday Pasta, which I indoctrinated tonight by cooking a recipe. 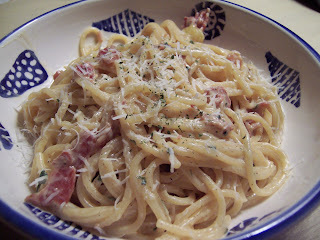 I, of course, made the recipe my own, but it was my first-ever carbonara and it was quite delicious, as has every recipe of Giada's ever been. 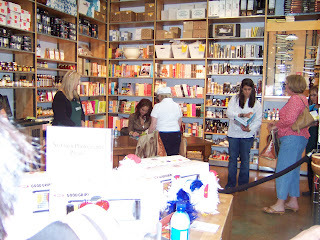 XOXO to Giada, for your health and sanity I am so glad your book tour is done and you are back in LA with your husband, friends and family, thanks for coming to Scottsdale. 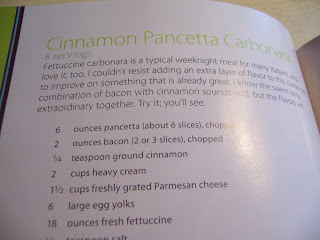 This recipe resembles Giada's, but the basics and the inspiration for the cinnamon is all hers, so she gets the credit. Boil pasta in salted water until al dente. Drain. Meanwhile, saute pancetta and spices until crisp and golden. 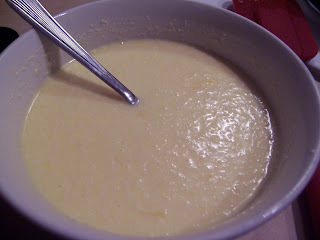 Mix milk, cheese and eggs in a bowl. 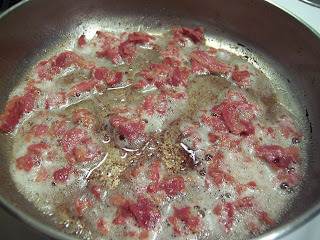 Add mixture to pancetta. Stir and simmer, don't let boil or eggs will scramble. 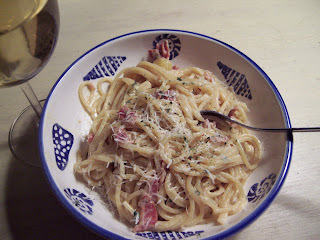 Pour mixture over warm pasta, add parsley, salt and pepper to taste, sprinkle extra cheese over top. Serve warm and creamy. 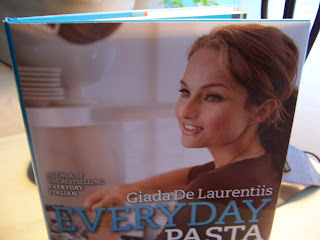 I'm thinking of buying one of Giada's book, now I want it more! I am writing about this tonight, but in advance I'll tell you that I agree 110% with your assessment. She's the real deal! Glad you had fun :) I made her sausage with rigatoni, peppers and onions and OH MY....delicious. 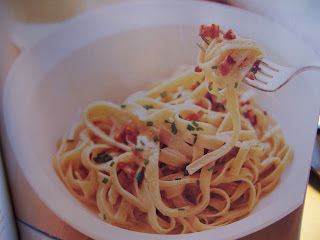 Can't wait to try the Carbonara! PS - I made the manicotti with ricotta and crab last night - MMM! I really like her recipes...but I still maintain the she doesn't hardly eat anything she cooks and what she does she throws up. Can't wait to read your account Kristen. How fun!! Mel, yeah, my vanity got the best of me. My arm looked not-so-great (fat) in the other one. :) Yesterday was SO fun, thanks for finding out about the event! Peabody - HA! I will agree with you by saying that everyone I know who LOVES food and cooks OFTEN is not 100 lbs...it's just math. And I will say pics I've seen of Giada looked slightly larger in her pre-Food Network career (still tiny, but more normal)...so I think being scrutinized for your looks all day on a TV show and living in LA must be over-the-top skinny pressure! For obvious reasons, this entry is my favorite so far! Although I have to side with Mel in that this pic (nice sun streak on my face) is NOT the attractive one we agreed on, but whatever. I love you anyway, Kirsten. 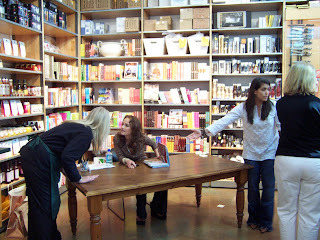 :) The day was SO fun, even despite the sweat and sore feet we endured for the 3 second "meeting" of fabulous Miss Giada. That quick sighting confirmed that she's even more gorgeous and loveable than she appears on TV. So not fair! I can't wait to start cooking (and eating) those pastas... Love you girls! LOL! 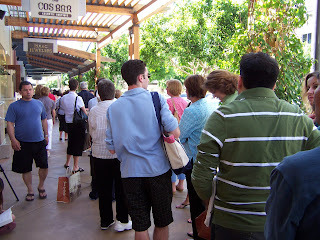 I did the same long wait for Ina Garten on her last book tour. I had never done that before... and it was FREEZING cold and we had to wait outside (of course) and I was underdressed and and and... 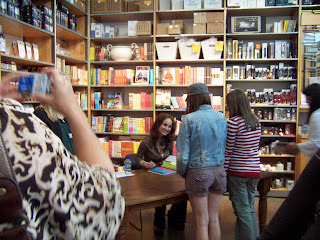 I am glad you had such a lovely line-waiting experience, and got to meet Giada!!! Janelle - too funny re: Ina. Thanks for your comment! That is so very cool! I am going to have to get that book! I have been trying to put the breaks on the cookbook purchases....but the tempatation is just too much! I would just like to state that as someone who makes carbonara often, you do NOT want the eggs to scramble. That is all. Oh, glad you had a good time! 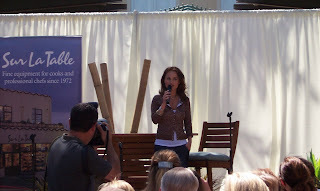 I am trying to find out if the cooking instructors worrked with Giada at the Sur La Table event. Could you let me know. I assume it was a Q&A and book signing, not a cooking demo by her. I am SO jealous! She was in SF, but I was working and just couldn't get away, looks like she's pretty great, and I love your description!